A good starting point is Finse. This summit may also easily be reached from Hallingskeid, the next stop on the railroad after Finse, when going west. Note that many trains bypass this station without a stop. From Vestre Storhaugane, ski west, descending to lake 1230m. Ascend on the south side of the mountain. Continue to the south-west side, then turn sharply right and ascend to the summit. 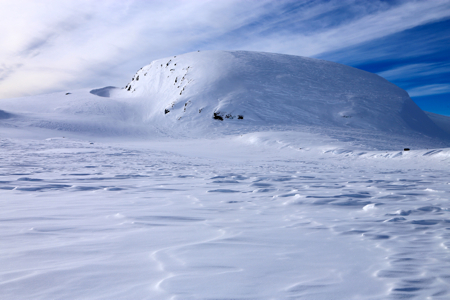 From the summit, I skied directly north, following the ridge that descends towards point 1260m. From here, ski east, then north towards Buadalen. Descending into Buadalen from the south, got me quickly to the main valley below the self serve DNT hut Hallingskeid. A short ascent and a very nice ski trip from Finse had been completed. The description is part of a nice ski route from Finse to the DNT self serve hut Hallingskeid. The previous peak was Vestre Storhaugane. The ski route was easy and I arrived at the summit around 1400. From here, I had a nice ski (mostly downhill) back to the hut Hallingskeid.